The AGM will take place on Friday 1st of December at 8pm in the Clubhouse. Motions are to be submitted in writing to Anne Fenlon or Sean McCabe by the 10th of November. Nomination forms are also available from Anne and Sean. 8 teams will battle it out against each other in a bid to become Monageer/Boolavogue’s biggest loser for 2017. The teams are all based on the townslands in Monageer and Boolavogue, made up of both men and women of ages, shapes and sizes. The biggest loser is the clubs biggest fundraiser each year, and also raises the profile of the club, and allows new people an opportunity to become involved. The competition kicks off in Monageer, in the GAA Complex with weigh-ins starting at 8pm. From then onwards, the floodlights in the pitch will be on every evening from 5pm to 10pm for people to exercise in safety. There will also be circuit training every friday night at 8pm for all participants. 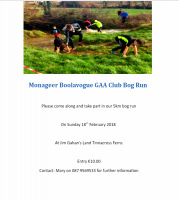 The first event will take place on the 5th of February, the bog run. The next event will be the cycle on the 19th. There are two options, a 16km option and a 40 km option. The final event is then on the 5th of march with the 8km run/walk, starting at the church in Boolavogue and finishing in the GAA complex in Monageer. There will also be a 2km walk option. Finally then, the final weigh in will take place on March 10th, with the winners being announced in the Harrow pub on the 11th of march. Each leader will be in contact with their team over the coming days. If you are not on a team and would like to be on one, please contact Mary Carton on 0879569533, all are welcome to participate. Each team will be running their own fundraisers over the course of the next few weeks. Please support the efforts of all participants, in their quest to become the Biggest Loser. There was no winner of the Lotto which now has a jackpot of €7,200. There was one match three winner which was Taragh Whelan who wins €160. The Next Draw will take place on August 2nd in Clubhouse at 9.30pm. Saturday August 6th is in the diary for Monageer/Boolavogue GAA Cardiac Screening programme. The clinic will be open from 9.30am-5pm. Each screening will take 20/25 minutes. Or people can click on the link below. We will be hosting our annual field evening in the Monageer Parish Field (Beside Parish Hall) on this Sunday 5th of June, after the Patron at 6.30 pm in Monageer. There will be all the usual games/events such as bottle stalls, cake sales, golf, horseshoes, guess the weight of a lamb, hurling target shooting, and many others during the course of the evening. We would like to invite all in the community and those who have come from further afield to come along and join in the fun, in what promises to be glorious weather conditions. Also if anyone has anything they would like to donate as a prize for the raffle or for one of the competitions they would be greatly appreciated, or if you would like to donate cakes/buns for the cake sale they would be very welcome also. Any of the above can be dropped off to the hall on sunday morning between 11am and 1pm, or they can be brought along in the evening. Please come along and have an enjoyable evening out in the sun.